There’s an old saying that compares exotic cars to beautiful women. Sometimes you can’t resist enjoying her beautiful, sensual curves, the saying goes. Sometimes, you’re stuck on the side of the road because the engine has exploded into a thousand pieces no larger than the human eyeball. OK, maybe that’s not an old saying. Maybe I just made it up. But it certainly rings true for the Ferrari F355. 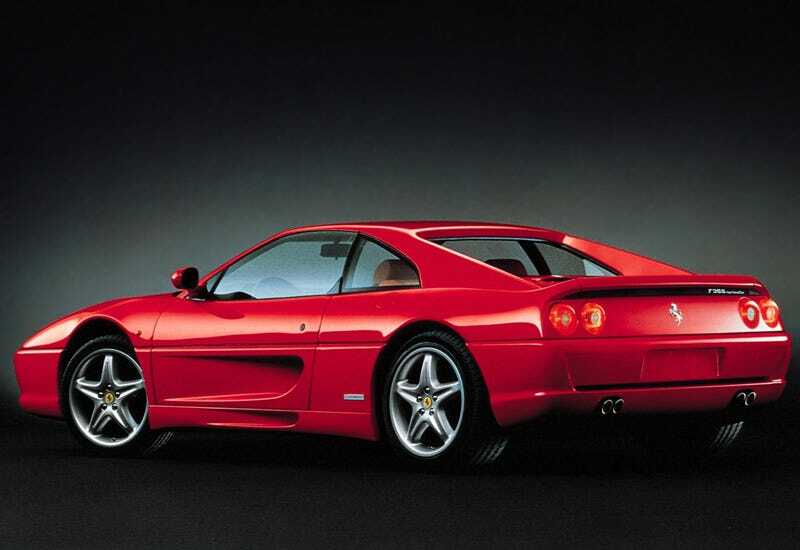 Now, before I get into the F355’s issues – namely that it costs about as much to own as a fighter jet – I think we should provide a little background on exactly what the Ferrari F355 is, for those of you whose Ferrari knowledge begins and ends with red, fast, and cocaine user. So here goes: the F355 was introduced in 1994 for the 1995 model year and it is, without question, the single most beautiful Ferrari manufactured in decades. Now, I know some people will say that looks are subjective, and other people will dispute my opinion. But here’s the thing: they are wrong. The F355 is one of the most beautiful modern cars ever designed. In a competition between the F355 and all other cars, the F355 would be Grace Kelly, and all other cars would be Joe the union longshoreman, who consumes two hot dogs and a large Coke every morning on the PATH train from New Jersey. The F355 also sounds amazing. When you step on the gas pedal in an F355, you feel the wind on your face, and you see the beautiful Italian-designed cabin laid out around you, and hear the howl of that glorious 375-horsepower 3.5-liter V8 as it climbs faster, and faster, and faster through the RPMs, delivering a noise that most normal people will never get to hear, in their little economy cars. And you’re all excited, and happy, and laughing, and smiling, and exhilarated. And then you stop. This will be the one time you rev your 355 this year. Because you’re worried that the next fun you have could result in a repair bill equivalent to a kitchen remodel. And this brings us to the Achilles heel of the F355: everything. Now, you might think I am exaggerating here for comedic effect, as I sometimes do. For example: I once referred to the Lincoln Navigator as a “tremendously impressive, seminal vehicle that forever changed the world of the airport limo driver.” And I once said that the original Mini has “about the same horsepower as an escalator.” And I admit, those were exaggerations. Silly, stupid exaggerations, and I apologize if I offended anyone working in PR for a) the Lincoln Navigator, or b) the escalator. So what’s so bad about it? Let’s start with problem the first: the exhaust manifold, also called the headers, or more appropriately an expensive chunk of poorly designed Italian metal. Here’s what happens to the F355’s headers: they fail. Routinely. So often that many Ferrari mechanics say it’s a one-hundred percent failure rate. Even worse, you never know when it’s going to happen. Could be 5,000 miles. Could be 40,000 miles. But when the headers finally fail, it ain’t cheap: driving around with damaged headers necessitates a full engine rebuild, which can cost well in excess of $25,000. Want to replace the headers before they fail? That’ll be four to five grand, please. That doesn’t sound so bad, right? Four or five grand? On a Ferrari? That’s POCKET CHANGE! Did you expect this thing to be a Chevy Traverse? Where people complain about $80 oil changes? And ask if it’s covered under warranty when their child pours orange juice in the rear DVD player? Well, read on. Next up on the “common failure list” is the valve guides. Ferrari famously fitted the 355 with weak bronze valve guides that fail under high RPM, or middle RPM, or low RPM, or if they hear you talking about them from the driver’s seat. Although the exact scope of this problem is disputed, even the most conservative estimates say 20 percent of all 355 models are affected. Given the potential issues that could accompany valve guide failure, most owners choose to replace the guides before they kick the bucket – at a cost of around $10,000. Do it with a routine engine-out service, however, and that figure drops to a far more reasonable six grand. What’s that? You heard “routine engine-out service”? Yes, ladies and gentlemen, that’s right: the F355 requires a complete engine-out service every three to five years in order to change the timing belts. This is another six to eight grand – remember, every three to five years – depending on where you do it. Some Ferrari dealers charge as much as $10,000. Although Ferrari is famous for these engine-out services, the 355 is the last modern model to require it. My 360 had a far cheaper engine-in belt service every three to five years, while the 430 requires no such service, as its engine is chain driven. And then we come to what F355 owners call “minor incidentals,” which are about as expensive as what you and I would call “property taxes.” Expect $1,000 every year to change the fluids. The interior parts eventually become sticky and require replacement or refinishing, which usually runs two to three grand. If you’re unlucky enough to get a 355 with an F1 transmission, expect to pay more than $10,000 when your F1 pump fails. And if your F355 Spider top gives up, you’ll be looking in the something-teen thousand dollar range for a replacement. If all this is getting a little dizzying, here’s a nice round figure. If you bought a 355 new in 1995, and you ONLY did all the “normal” maintenance – a few sets of tires, a brake job, belt services every four years, annual fluid changes, and the reliability upgrades for the headers, the sticky interior parts, and the valve guides – you would’ve spent almost $80,000 doing all this work. You also would’ve lost about $85,000 in depreciation, and you probably would’ve only driven around 20,000 miles, for a grand total of more than eight bucks per mile, not including fuel, insurance, taxes, and any other repairs that aren’t listed here – of which, let’s be honest, there will be many. It’s about the same as driving into Manhattan every single time you want to go for a ride. Now, the F355 owners over on the Ferrari forums will see this, and they’ll say that it’s all relative. So what? they’ll say. It’s beautiful, it’s fast, it’s gorgeous, and it sounds better than any other modern Ferrari. And the thing is, they’re right: it’s all those things. But the 360 costs about half as much to own as the 355, and it’s faster and more modern. The 430 costs even less to own than the 360, and it’s even faster and even more modern. So is it worth paying that premium just to own one of the most beautiful cars in the world? There’s an old saying about this, too. You cannot put a price on the most beautiful car in the world, the saying goes. Your bankruptcy attorney will do that for you.